We made this delicious pizza recently and I’m quite pleased to see that it looks very much like the photo in bon apppetit where we got the recipe. This is my photo below. Click here to see theirs. 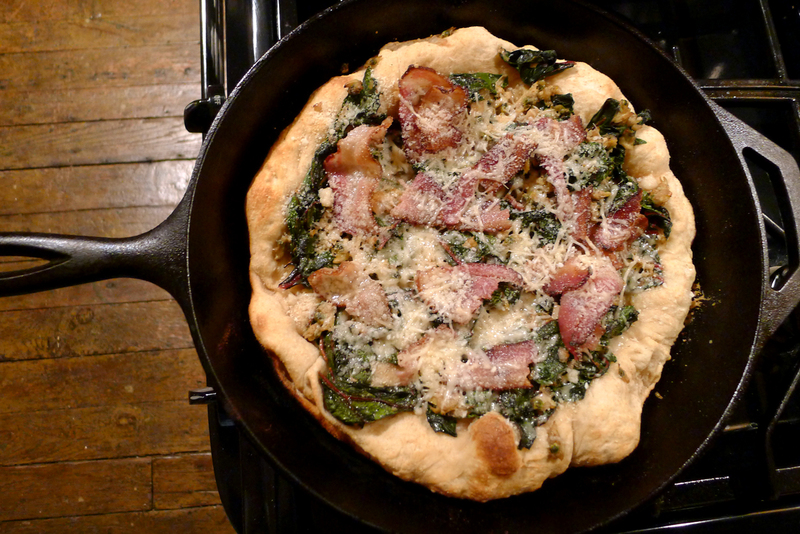 When you make this dish, definitely use the cast iron skillet preparation for the most amazing crust you can imagine! Preheat oven to 500°. Fill a large bowl with boiling water. Place a baking sheet over; dust with flour. Place dough on baking sheet; cover loosely with plastic wrap and let sit for 10 minutes to soften. Flip dough; cover and let sit 10 minutes longer. Meanwhile, drain clams, reserving liquid. Cook bacon in a 12″ cast-iron skillet over medium heat, stirring occasionally, until lightly browned, 4–5 minutes. Transfer bacon to a paper towel-lined plate. Add garlic and shallot to drippings in skillet and cook, stirring occasionally, until softened, about 2 minutes. Stir in chard and 1/2 cup reserved clam liquid and cook, stirring, until chard is just wilted, about 2 minutes. Season to taste with salt and pepper. Stir in butter, vinegar, and as many clams as you’d like. Transfer mixture to a medium bowl. Wipe out skillet and heat over medium-high heat until very hot. Roll out dough on a lightly floured surface to a 12″ round. 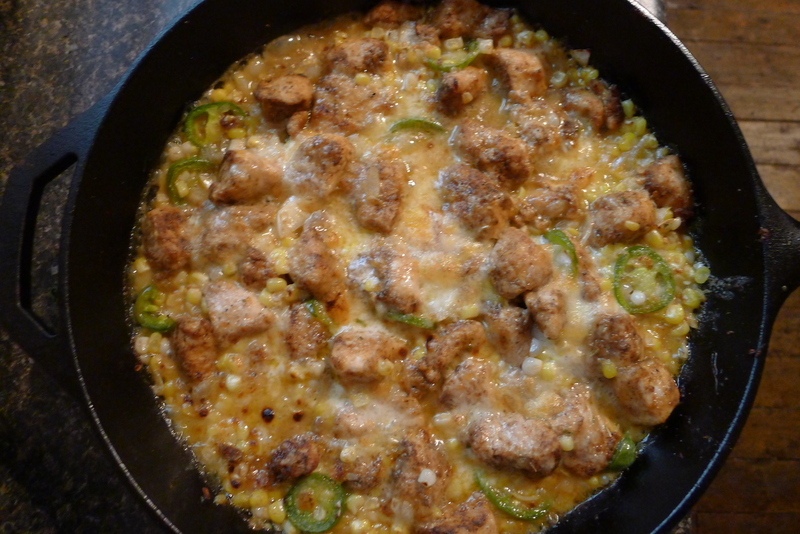 Sprinkle skillet with cornmeal and transfer dough to skillet. Brush top of dough with oil. Cook, shaking pan occasionally and turning pan to avoid hot spots, until bottom of dough is golden and crispy, 6–8 minutes. Spread chard mixture over dough. Bake until crust is golden and cooked through, 6–8 minutes. Scatter bacon and cheese over; cook just until cheese is melted, 2–3 minutes longer. This is one of my favorite times of year when it comes to seasonal cooking, and Native Offerings Farm has hooked us up in the squash department. I definitely see more of this dish in our Thanksgiving Day future. This recipe is from the NY Times and it goes really well with a good old fashioned grilled cheese sandwich. Preheat the oven to 325 degrees. Using a large, heavy knife, split the squash in half and scrape out the seeds and discard them. Place the squash halves on a baking sheet, season with salt and pepper and roast until very tender, about 1 hour. Use a spoon to scrape out the flesh; set aside, discarding the skin. In a large pot set over medium heat, melt the butter. Add the onion and garlic and cook, stirring frequently, until the onion just turns golden, 6 to 7 minutes. Add the stock and squash and cook, uncovered, for 25 minutes. Allow to cool. 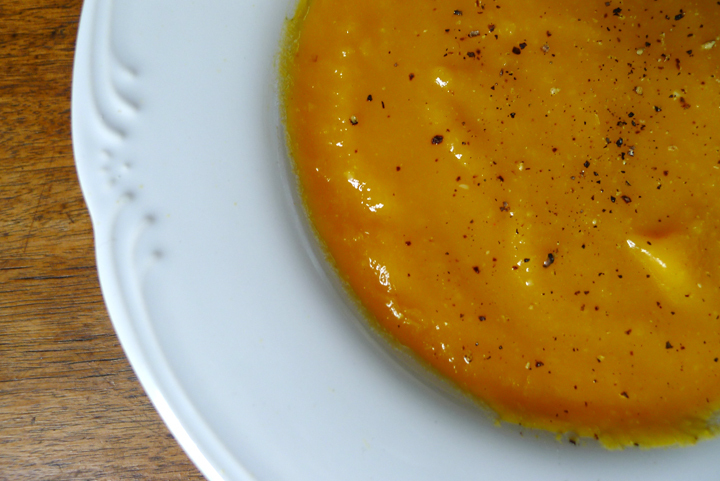 Working in batches, puree the soup in a blender or food processor and return it to the pot. Stir in the milk and cream and reheat. Season to taste with salt and pepper and serve garnished with red onion and chervil. I made this coleslaw to go along side a Mexican pork dish with a mole sauce and it was a lovely accompaniment. I used a whole head of cabbage from the share, so there were plenty of leftovers. They kept very well and I was able to serve them to guests as an horesdorve the next night too. The avocado gives the dish a delightfully creamy texture, the cilantro and lime really compliment the zingy cabbage flavor and the red onion adds just the right accent for a finishing touch. 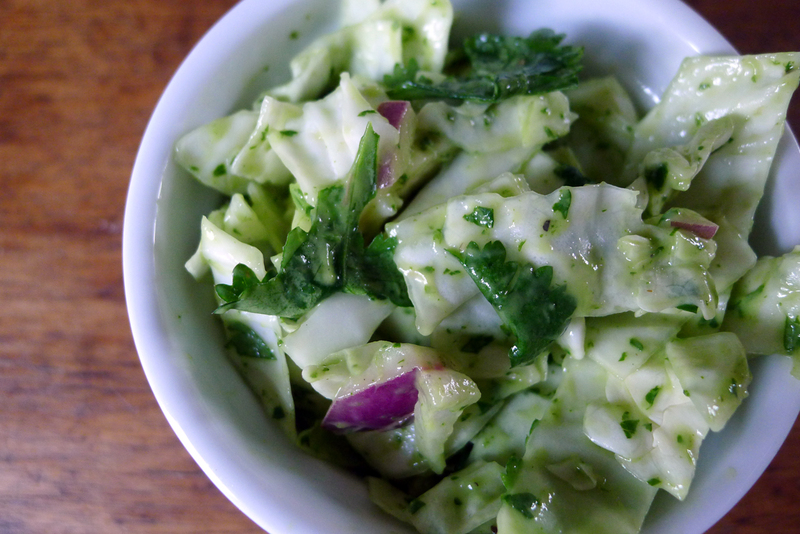 Combine cabbage, red onion and 1 Tbsp of minced cilantro. Set aside. Combine remaining ingredients in blender and blend until smooth. Add water as needed. Toss with cabbage mixture with dressing and let refrigerate for at least 20 minutes. 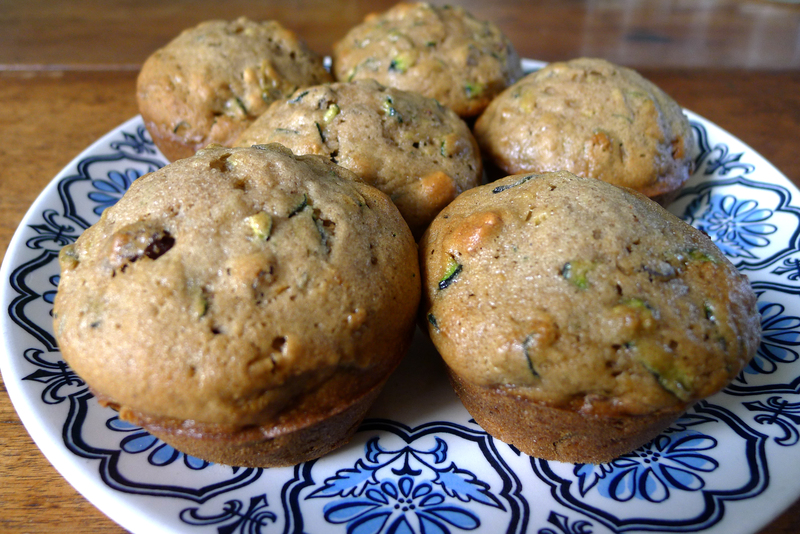 I made these delicious zucchini muffins for a cookout at my friend Lisa’s house today. This recipe is so good it almost makes me want MORE zucchinis. Almost. I definitely recommend adding the raisins and walnuts like the recipe suggests. Along with the cinnamon and nutmeg, they really enhance this sweet, hearty treat. You don’t need a mixer for this recipe. 1 Preheat the oven to 350°F (175°C). In a large bowl combine the sugar, eggs, and vanilla. Stir in the grated zucchini and then the melted butter. Sprinkle the baking soda and salt over the zucchini mixture and mix in. In a separate bowl, mix together the flour, nutmeg, and cinnamon. Stir these dry ingredients into the zucchini mixture. Stir in walnuts, raisins or cranberries if using. 2 Coat each muffin cup in your muffin pan with a little butter or vegetable oil spray. Use a spoon to distribute the muffin dough equally among the cups, filling the cups up completely. Bake on the middle rack until muffins are golden brown, and the top of the muffins bounce back when you press on them, about 25 to 30 minutes. Test with a long toothpick or a thin bamboo skewer to make sure the center of the muffins are done. Set on wire rack to cool for 5 minutes. Remove muffins from the tin let cool another 20 minutes. Note, if you are including walnuts and dried fruit, you will likely have more batter than is needed for 12 muffins. A milestone: We will be publishing our 1,000th recipe today! To ripen hard fruits, such as peaches and nectarines, put them in a brown paper bag, don’t overcrowd, close the bag, but not tightly, and let sit at room temperature for a few days. Check, taking out ones that have ripened. Some people like to put an apple or banana in the bag with the fruit. This can speed up the ripening process, but can also hasten spoilage, so if you choose this latter method, check the fruit everyday. 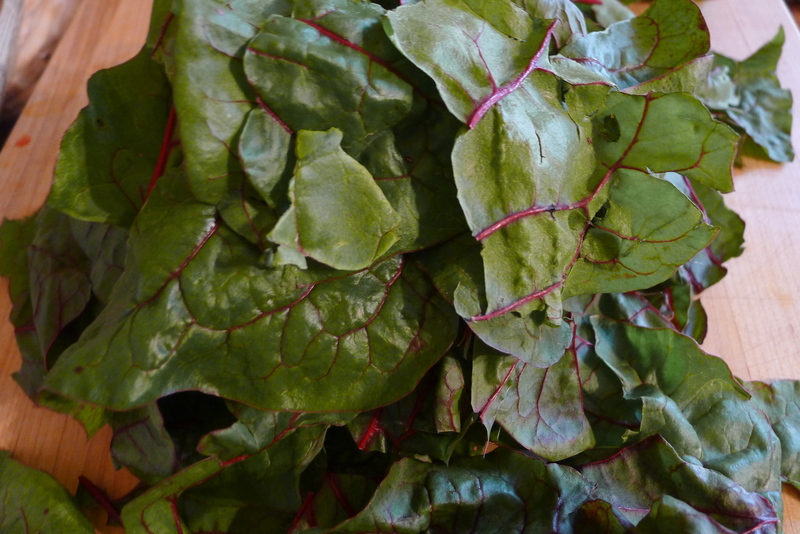 The Vegetable Share: Beets (Detroit Red, Golden, Butter, Choigga); Sweet Onions; Napa or Green Cabbage; Chard or Green Kale; Zucchini/Summer Squash; Herbs–choice of Basil, Cilantro, Dill, Dill Flowers (Umbrels), Parsley, Sage; Sub–Cayenne Peppers. The Fruit Share: Plums; Peaches; Nectarines. Recipes: Creamy Beet Gratin; Thai Pasta with Cabbage; Breaded Zucchini Cutlets; Chard and Bean Soup with Herbs; Kale Calallo; Hot Pepper Sauce. Position a rack about 4 inches from the broiler and heat the broiler to high. Toss the chicken with the chili powder, cumin, 3/4 tsp. salt, and 1/2 tsp. black pepper. Lightly dredge the chicken in the flour and shake off any excess. Melt 2-1/2 Tbs. of the butter in a 12-inch ovenproof skillet (preferably cast iron) over medium-high heat. Add the chicken and cook, stirring occasionally, until browned, about 5 minutes. Transfer to a plate. Add the remaining 1 Tbs. butter, the corn, jalapeño, garlic, and 1/2 tsp. salt. Cook, stirring, until the corn begins to brown lightly, 2 to 3 minutes. Add the chicken, lime juice, oregano, and 1/2 cup water. Cook, stirring, until the chicken is just cooked through, about 2 minutes. Sprinkle with the Cheddar and transfer the skillet to the broiler. Broil until the cheese melts and browns on top, about 3 minutes. Serve with lime wedges. I had two weeks worth of green beans to use so I decided to make a cold salad with some of them. I’ve been meaning to find a good Quinoa recipe too and this seemed like the perfect time. I turned to Gojee.com which sent me to this recipe and it turned out great. It’s a surprisingly elegant salad with lots of refreshing flavor and it’s easy to make. Cook the green beans in boiling, salted water for 2 minutes, until tender but still crunchy. Rinse under cold water, drain and pat dry. 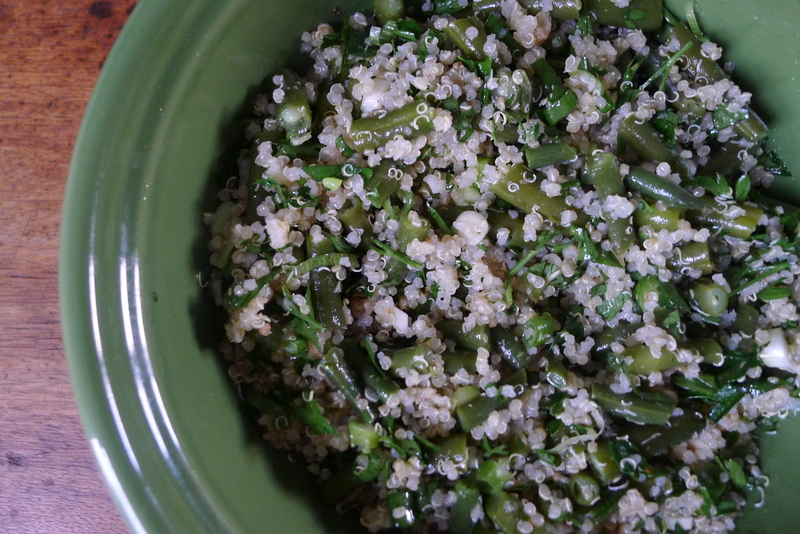 Combine with the quinoa, pecans, parsley, scallions, and mint in a large bowl. Whisk together the oil, lemon juice, garlic, salt, and pepper. Pour over the salad and toss to blend. Let stand for 10 minutes before serving. 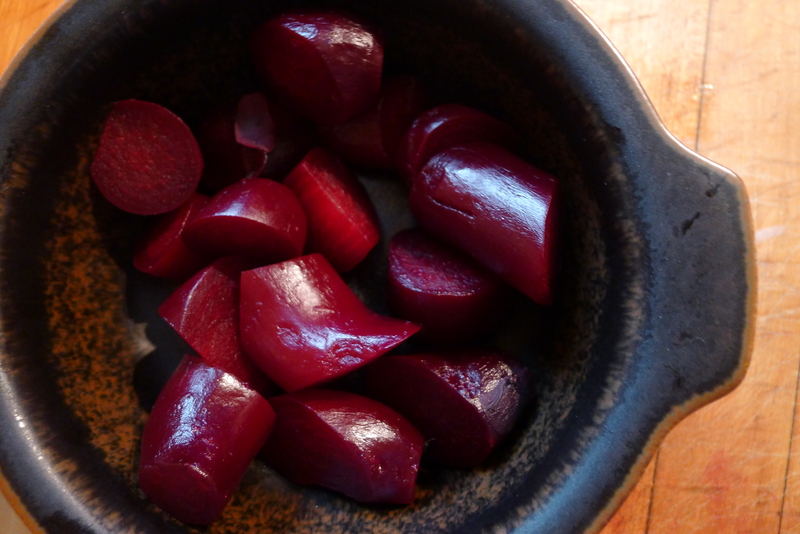 Today I decided to saute the chard and roast the beets. Served together with red wine vinaigrette, red onions and goat cheese makes delicious nutritious too! 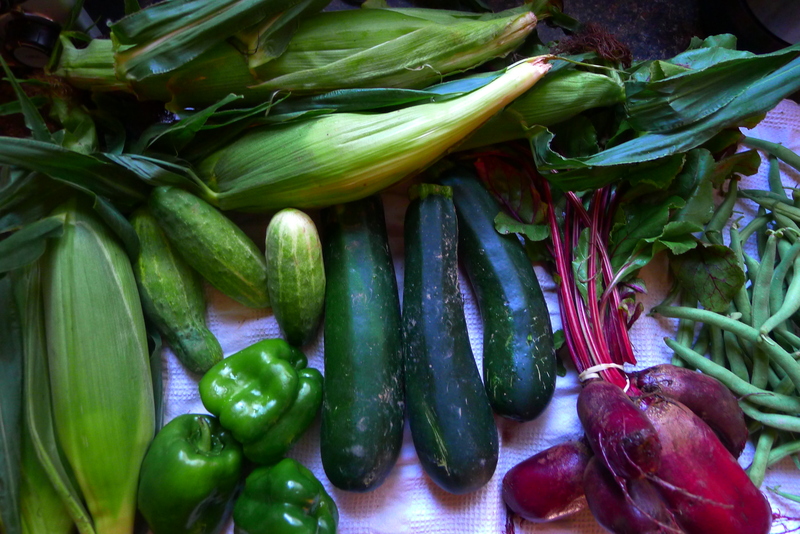 The Vegetable Share: Carrots with tops; Beets with Greens; Zucchini/Summer Squash; Green Peppers; Cucumbers; Green Beans; Sweet Corn; Herbs–choice of: Basil, Dill, Cilantro, Parsley, Sage, Rosemary, Thyme. The Fruit Share: Peaches; Plums–Yellow, Red. Recipes: Zucchini and Cucumber Gazpacho; Indian-Spiced Green Beans; Roasted Corn with Basil Vinaigrette; Tunisian-Spiced Frittata; Wine-Poached Beets; Plum Chile Salsa.